VC Series threadlockers are designed to be adjusted, removed, and reused. They utilize a blend of acrylic resins in a solvent base, which are applied to fasteners and dried first, then installed into mating part. 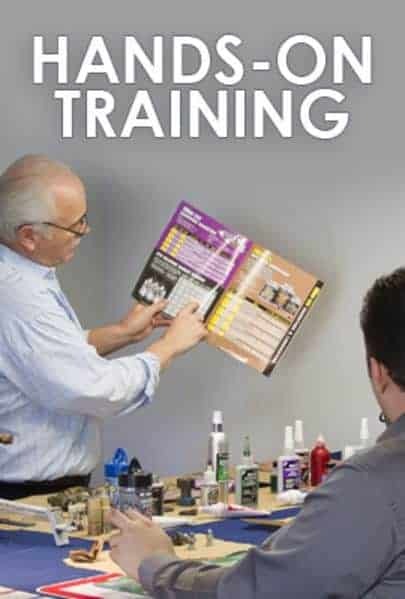 The primary difference between all these products is the solvent carrier. VC-3 is Methyl Ethyl Ketone, VC-4 is Ethyl Acetate, VC-5 is Methyl Propyl Ketone, and VC-6 is Dimethyl Carbonate. Each of these solvents reacts differently when in contact with specific plastics. If you have a metal fastener; whether installed into a mating metal or plastic part, we recommend VC-3. Apply VC-3 to the metal fastener then allow it to fully dry. The MEK solvent should have evaporated leaving behind an inert polymer which will not react with other materials. You can then install the metal fastener into the plastic mating part. However if you plan to use these threadlockers directly on a plastic part, please consult the following table as a reference and be sure to TEST FIRST before using in production. 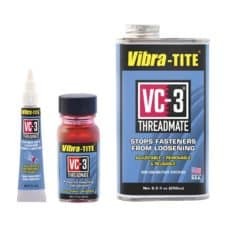 Vibra-Tite VC-4 exhibits similar performance to Vibra-Tite VC-3 except it contains a base solvent of Ethyl Acetate. VC-4 is one of the most versatile threadlockers available on the market. 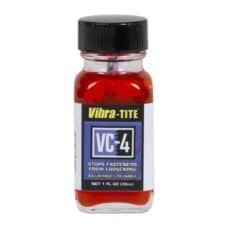 Unlike traditional liquid lockers which cure to form a hard bond, VC-4 is a blend of resins designed to remain flexible and absorb vibration. This unique difference makes VC-4 coated fasteners truly adjustable, removable, and reusable. Vibra-Tite VC-5 exhibits similar performance to Vibra-Tite VC-3 except it contains a base solvent of Methyl Propyl Ketone. VC-5 is one of the most versatile threadlockers available on the market. Unlike traditional liquid lockers which cure to form a hard bond, VC-5 is a blend of resins designed to remain flexible and absorb vibration. This unique difference makes VC-5 coated fasteners truly adjustable, removable, and reusable. Vibra-Tite VC-6 exhibits similar performance to Vibra-Tite VC-3 except it contains a base solvent of Dimethyl Carbonate. VC-6 is one of the most versatile threadlockers available on the market. Unlike traditional liquid lockers which cure to form a hard bond, VC-6 is a blend of resins designed to remain flexible and absorb vibration. This unique difference makes VC-6 coated fasteners truly adjustable, removable, and reusable.